While never quite the lean, ruthless thrill machine that its blockbuster 1984 predecessor was, Terminator 2: Judgment Day boasts other delights and virtues. For one thing, it continues the story of the frequently imperiled Connors with stirring intensity and amazing pyrotechnics and stunts. 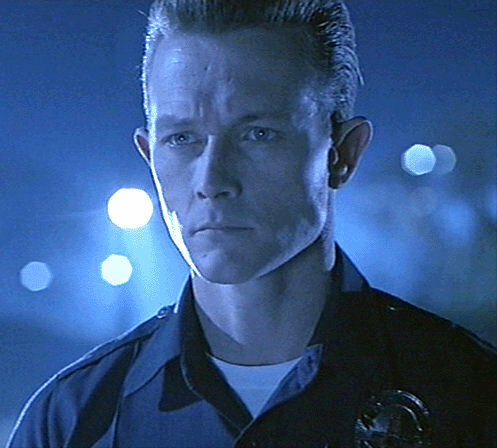 And -- perhaps more significantly -- it provides the genre one of its most amazing and influential villains: Robert Patrick as the T-1000, a shape-shifting, CGI-morphing leviathan. Patrick carries his strength not merely in his narrow, athletic form (a far cry from the bulging, super-muscular Schwarzenegger) but in his predatory, all-seeing eyes, which showcase enormous power and drive. Notably, Cameron also mines the Terminator character (Arnold's, I mean) for laughs. The T-800 is the proverbial fish-out-of-water, unable to understand key aspects of the human equation, including how to smile, or why human beings cry. This set-up fits in very well with Cameron's career-long obsession with the outsider; the person unfamiliar with a world/class system who steps in and attempts to navigate it, all while simultaneously pointing out its deficits. The outsider can be social gadfly or observer, and reveal a new perspective about the film's dominant coalition (Ripley as the non-marine/non-Company exec in Aliens; Jack a Dawson lower-class passenger on the Titanic, etc.). And once more, this lesson fits in with the film's real life historical context: 1991 was the year of the first Gulf War, the first televised war which saw the deployment of precision or "surgical strikes" on enemy targets. Underneath the impressive Defense Department briefings on the War -- replete with stunning camera imagery of bombs striking targets -- the truth was evident. Our automated weapons had made a quantum leap forward in accuracy and destructive power since the Vietnam War Era. 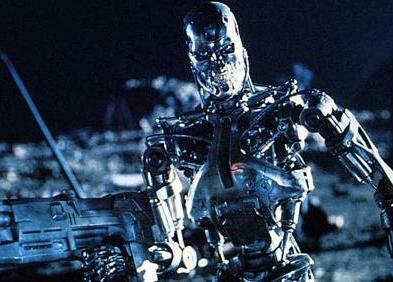 The Terminator (and SkyNet too) thus did not seem so far out of reach, given the (automated) tech we saw deployed in Desert Storm. Today, we are even further down that road with our automated Predator drones and the like. 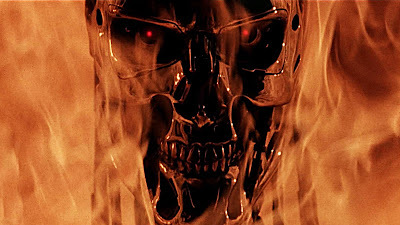 Ultimately more complex, if less driving and focused than The Terminator, T2 also derives significant energy from audience expectations; playing ably on our preconceived beliefs about the series. And again, Cameron was on the vanguard of a movement in cinema here. The 1990s represented the era of the great self-reflexive genre movie, from efforts such as John Carpenter's In The Mouth of Madness to Wes Craven's New Nightmare and the popular Scream saga. Part of this Terminator sequel's appeal rests strongly in the creative fashion that it re-shuffles the cards of the Terminator deck to present new outcomes, and new twists and turns. 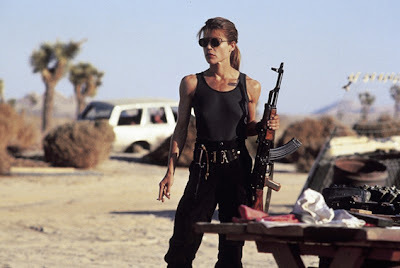 The film gently mocks the franchise and the cultural obsession with "political correctness," transforming the Terminator into a "kinder, gentler" model who only shoots out kneecaps. The implication of this approach, of course, is that Sarah -- in preparing for the future -- has sacrificed the very thing worth fighting for, her humanity itself. Terminator 2 very much concerns Sarah's loss of humanity, and her opportunity to re-discover it, in large parts due to her son, John. As the movie begins, Sarah is lost and overcome with pain about the future that awaits mankind. But John ultimately teaches Sarah that it is okay to hope again, that the future is "not set," and that there is "no fate but what we make." Although it spends relatively little time in the post-apocalyptic future compared to The Terminator, T2 is nonetheless haunted by the specter of nuclear war, another familiar Cameron obsession. In this case, no less than five views of a playground are featured in the film. The playground is seen at peace (before the war, in Sarah's dream), in flames (during the war), and ruined (after the war), behind the prowling, murderous Terminators. The pervasive playground imagery reminds viewers again and again what is at stake if humans take the unfortunate and unnecessary step of rendering this planet virtually uninhabitable: the innocent will suffer. Children do not boast ideologies or political parties, and do not care about issues like nationalism. They are collateral damage in any such bloody conflict, and the prominent placement of the playground -- the domain of the child -- throughout the film makes this point abundantly plain. But yet again, that sense of hope sneaks into the movie. John Connor -- a male child -- proves able to curb the killing instincts of Sarah Connor and the T-800 here, paving the way for what ostensibly should be a positive future. In almost all genre films, children represent the opportunity for a better future or better tomorrow, and T2: Judgment Day adheres to that trend. It is possible to change, to correct our course, but sometimes it isn't this generation, but the next that sees that potential. But of course -- as we know from Cameron's other films -- the magic of the director's films occurs not just in the staging of the action, but in Cameron's capacity to make the action stirring. He makes the action affect us on an immersing, emotional level. Here, we have characters we truly come to care about (Sarah, John and the T-800) and so we feel heavily invested in the narrative's outcome. 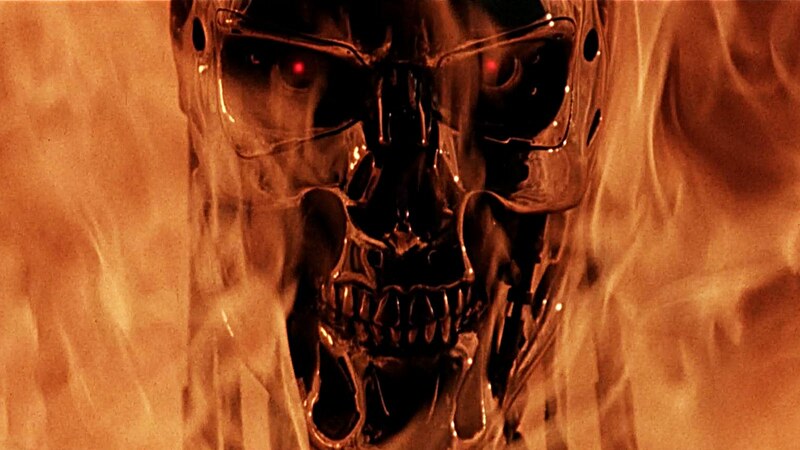 I'm not ashamed to admit it, but when the T-800 sacrifices himself in the lead works, I always get a bit misty-eyed. For John, he is losing a father and a best friend. And the T-800 has finally learned what it means to be human, and in doing so come to the conclusion that self-sacrifice is necessary. It's a great, even inspirational ending, if one sadly marred by the cheesy "thumbs up" gesture that accompanies the beloved character's demise. T2 is a bigger film than its immediate predecessor, and more ambitious in many ways. 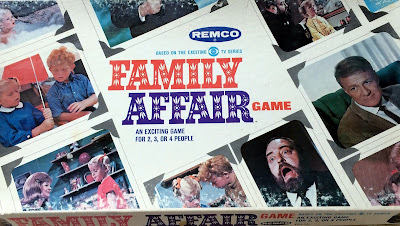 It isn't however, quite as hungry, quite as lean as the 1984 original. There's a sense here that the movie knows it is a blockbuster, and doesn't have to deliver on quite the same visceral level. 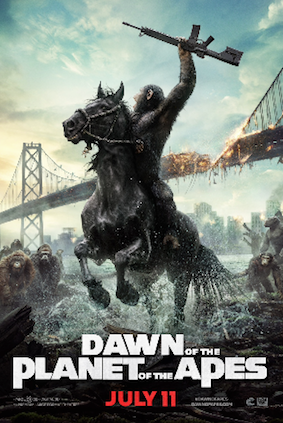 Still a great film, of course, but these days I prefer, at least slightly, the first entry in the franchise. 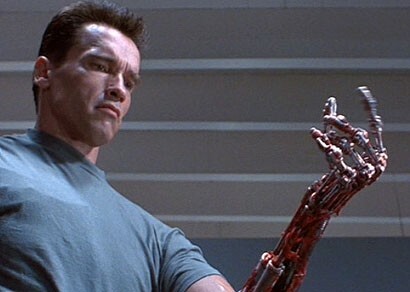 I say this all the time but Terminator 2 is the best action movie in my books. Perhaps it has something to do with having seen it first time at age 10. I can remember the playground nuclear apocalypse scene haunting me even at my early teens. Although I do like the film, but have some pet peeves about it. The pioneering CGI effects still hold up very well today. Especially amazing considering how far we have come since then. But some of the practical make up FX I felt were surprisingly weak. 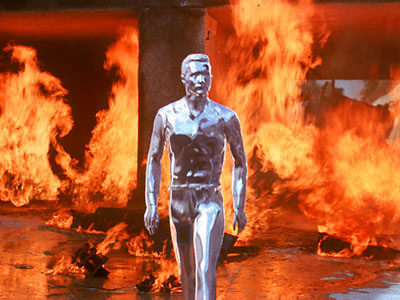 The fake head of the security guard who is killed via the eye stab and the head of Arnie that gets crushed by the T 1000 always struck me as being extremely poor. I also got tired of the film's hackneyed peace message (and I am a pacifist, btw). On the other hand, great action with an awesome final act. I still for the life of me can't understand how Robert Patrick didn't become a huge star after this.